Retail sales rose last month after a fall in October, and online spending hits a record. Many high street retailers have warned of slow Christmas trading, but figures released by the Office for National Statistics suggest retail sales picked up last month. Retail sales volumes rose 0.3%, the fastest monthly growth in the month of November since 2010. Compared to November 2012, sales were 2% higher with the average weekly spend in UK shops estimated at £7.6bn. Meanwhile a record amount of goods were bought online, accounting for 11.9% of total retail sales excluding fuel. Once again, the change was attributed to the British weather, as shoppers stocked up on warm clothes as cold weather drew in after a mild start to autumn, the ONS said. Textiles, clothing and footwear sales volumes jumped 3.8% in November compared to the month before, which helped offset weaker fuel sales and a fall of 3.1% in department stores. 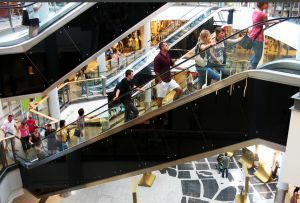 It comes a day after the Confederation of British Industry (CBI) said retailers had seen a surge in sales as people rushed to do last-minute Christmas shopping. ‘Customers have clearly held off spending through the autumn and we're only now seeing them start to hit the stores,’ the CBI said. However, it comes after a difficult few months for Britain’s shop owners. Because of the delay in cold weather, retailers were left with piles of unsold winter coats and jumpers, and many have started heavy discounting to entice shoppers to spend. Earlier this week, Debenhams demanded a 2.5% discount from its suppliers to help cut its bills.